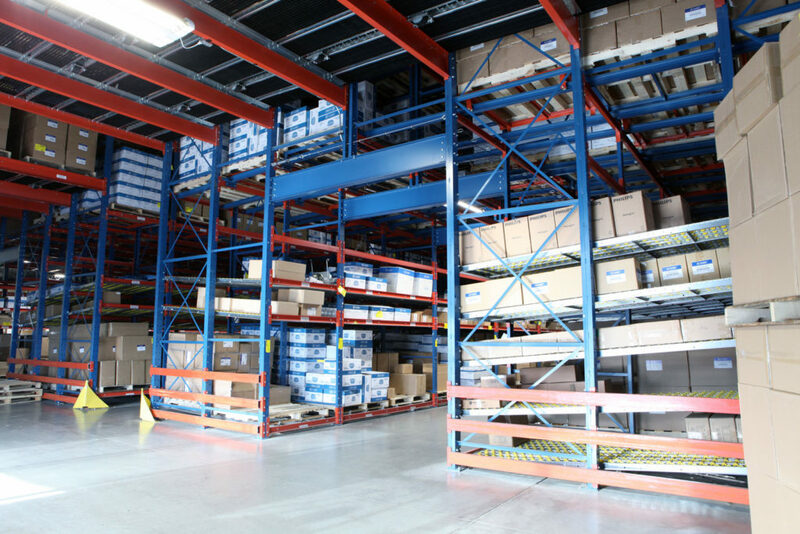 A key focus at Frazier Industrial Company is providing customers with the best-fit rack Storage Solutions to meet their business needs. Among our portfolio, Frazier offers Pick Modules and Pick Tunnels, which provide the greatest flexibility for applications with a high number of SKUs (Stock Keeping Units) to be picked. Pick Modules are multi-level picking systems while Pick Tunnels are single-level picking systems with bulk overhead storage. Both integrate SelecDeck® Case Flow and Pallet Flow racking to afford users flexibility in picking applications. Pick Modules provide a means to fulfill orders quickly while maximizing the facility’s space utilization via a multi-level design. The multi-level design increases productivity by an average of 30%. For instance, a single “picker” can make 400 picks per hour from a Pick Module as opposed to the 70 they could make in hour by using an order picker truck to pick from conventional racking. A worker picks cases from the 2nd level of a Pick Module. 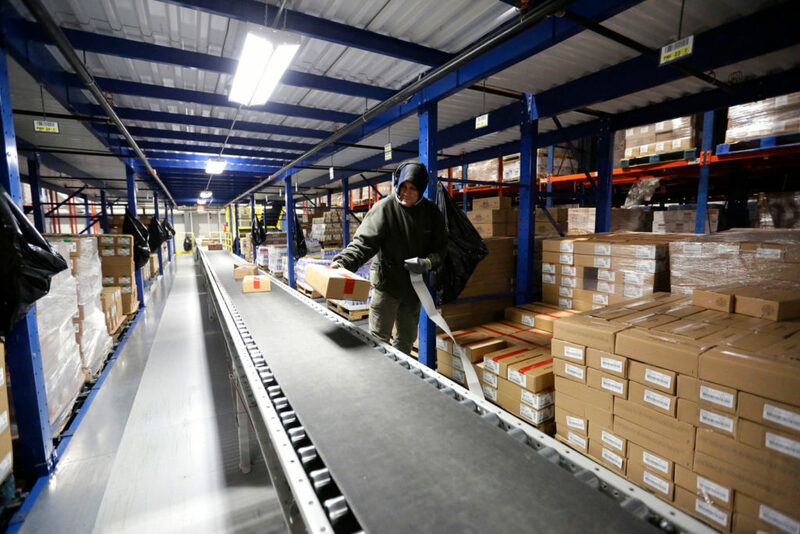 The integration with a conveyor system will improve performance by moving product throughout the Module, thereby allowing workers stationed at set areas to fulfill orders together via a stock-to-picker method. In a stock-to-picker method, each picker’s responsibility are only the SKU’s located in their area. The alternative strategy without a Pick Module is a picker-to-stock method, where the picker walks throughout the whole system to fulfill an order. A picker-to-stock method requires a greater amount of travel time for each order. Surveys have shown that up to 63% of distribution activity revolves around picking. Travelling makes up 60% of the time spent picking. Utilizing a Pick Module with a stock-to-picker strategy will cut travel time by up to half, resulting in boosted productivity; the results are measurable – workers are afforded the ability and time to fulfill a greater amount of orders. Solutions centered around Pick Modules have excelled within the Beverage and E-Commerce industries because of their ability to cater to both sector’s fast moving, eaches driven picking styles. A Pick Tunnel accommodates bulk storage above its picking space. Pick Tunnels also improve order fulfillment using the stock-to-picker method, albeit with a single level of picking. Typical applications for a Pick Tunnel have fewer SKU counts for picking to accommodate than a Pick Module; the single level of pick faces within the Tunnel suffices as space for all fast moving each and case based increments needing to be picked. Where additional levels exist in a Pick Module, bulk storage (via Pallet Flow or Glide- In® Push Back) exists in a Pick Tunnel. The bulk storage houses slow moving products or products that will eventually replenish the stock being picked from floor level. In industries such as the Retail sector, Pick Tunnels have allowed users to pick orders made up of the current season’s product, while storing inventory for next season just overhead. To arrange a complimentary visit to discuss Pick Module or Pick Tunnel solutions with a Frazier Storage Expert, contact us at frazier@frazier.com.